For over three decades, genre fiction’s reigning editor Ellen Datlow has helmed nearly a hundred anthologies, including the acclaimed Year’s Best Fantasy and Horror series (co-edited with Terri Windling, from 1988 to 2008) and The Best Horror of the Year (2009–). Datlow has put out some of the highest-quality horror anthologies in the market, but also humbly states that she’s no expert or critic of the genre; even so, in the world of high-quality modern horror in the market, Datlow is an undeniable authority. 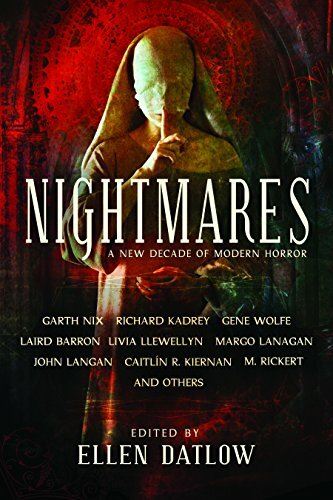 With Nightmares, Datlow has similarly reprinted 24 works of shorter horror fiction published between 2005 and 2015, and from authors in a wide range of genres, including Caitlín R. Kiernan, Dan Chaon, Gemma Files, Garth Nix, Gene Wolfe, John Langan, Livia Llewellyn, Stephen Graham Jones, Laird Barron, M. Rickert, Brian Hodge, and Richard Kadrey. Subjectivity is the name of the game when it comes to anthologies of any sort. Just as the stories in Nightmares were standouts for Datlow, there will be standouts among them for its readers. And while a number of them had originally come onto Datlow’s radar in previous anthologies she’d edited, many of them are not. And while most of the stories were originally published in one anthology or another, there are a few that had come straight from author’s exclusive collections, showing the extent of Datlow’s considerations. To pick “highlights” from Nightmares’ table of contents only further emphasizes the subjective nature that is inherent to anthologies; the fact that these are all reprints only adds to this. Thus, for readers may be unfamiliar with a handful of the authors, a few stories will be detailed. Following Hodge’s tale is Kaaron Warren’s “Dead Sea Fruit.” A nurse is disturbed by an eerie tale related by several anorectic girls. They claim to have been kissed by a figure that they call the Ash-Mouth Man—whose kiss leaves nothing tasting the same, ever again. There’s a languid, dreamlike quality to this tale, which makes its disquieting denouement all the more surreal. And following that story is Lisa Tuttle’s “Closet Dreams,” in which a woman recounts how she’d been kidnapped and imprisoned as a little girl, and how she’d found a means of escape in a most unusual—and metaphysical—manner. To say more would be to spoil it, but suffice to say, this morose and haunting story is as surreal as the best Twilight Zone episodes. M. Rickert’s “Was She Wicked? Was She Good?” is a powerfully unsettling tale of an all-too-real struggle: when parents have a child that enjoys inflicting pain upon animals. Only, in this case, the animals are fairies . . . and it’s not only the worried parents who feel the need to discipline the problematic child. John Langan’s “The Shallows” is a gloomy tale of a man living in a world following the cosmic takeover by H. P. Lovecraft’s Great Old Ones. Taken from Darrell Schweitzer’s similarly-themed collection Cthulhu’s Reign, this story is chock full of languidly macabre imagery, with a powerfully upsetting and disturbing revelation in its final paragraph. Arguably the most worrying (if not polarizing) tale of the bunch is Livia Llewellyn’s “Omphalos.” This story follows a disturbingly dysfunctional family as they travel the roads of the American west in their RV, while the second-person protagonist seeks some kind of divine exodus. Deeply uncomfortable and yet undeniably beautiful, this transgressive tale will surely make even the most robust and jaded readers of dark fiction squirm. The anthology nicely closes out with Richard Kadrey’s “Ambitious Boys Like You,” reprinted from Datlow’s 2015 anthology The Doll Collection. Two young burglars decide to break into an old man’s even older house, rumored to be haunted. What they find inside are not ghosts, but something far darker and insidious. Throughout the book are darkly hypnotic illustrations from artist John Coulthart, and with a perfectly unsettling cover image by Nihil, this anthology is handsomely presented, perfectly complementing its contents. Nightmares is more than just a memorable and collective anthology; it is an excellent showcase of some of the finest names in contemporary horror and weird fiction, as well as one of the knowledgeable influence of the genre’s leading editors.